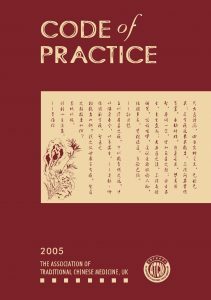 The Code of Practice is published by the Association of Traditional Chinese Medicine & Acupuncture UK (ATCM) to define the hygiene and safety standards relating to the practice of Traditional Chinese Medicine (TCM). Members must ensure that they have received adequate training in all aspects of hygiene and sterile procedures connected with their work, and that they meet the standards outlined in this Code. The Code defines the minimum standards required of safe TCM practice. Although it is not legally binding, members are reminded that failure to comply with the Code is a breach of the ATCM’s Code of Professional Conduct and may render you liable to disciplinary action. Although this code is divided into several parts, it applies to all staff working in a TCM practice. As a professional TCM practitioner, ATCM registered members’ duty of care to their patients involves taking every reasonable precaution against cross-infection. Poor hygienic procedures can result in serious damage to the health of both you and your patient. The best means of avoiding cross-infection in TCM practice is to follow scrupulously the hygiene and sterilisation methods outlined in this Code at all times. The Council undertakes to identify a pool of practitioner members or independent translators, where necessary, as a resource to enable members of the public for whom English is not a first language to be given explanations of the main requirements of the Code in their native tongue. The procedures described in this Code, when properly carried out, provide protection against all known cross-infection, including Hepatitis and AIDS/HIV. Members must also be aware of and comply with the relevant bylaws of the Local Authority under whose jurisdiction you practise. Advice on the bylaws and equipment relating to TCM practitioners is available from local Environmental Health Department. Where Local Authority bylaws have been enacted which set higher standards than those in this Code, these should be referred to as the definitive document for legal purposes. Where no bylaws have been enacted, or where bylaws require standards lower than those in the Code, members must always comply with the standards set by this Code.